Need to add resistance to your training? Want to improve your strength and athletic agility? Try a weighted vest such as the Cross 101 40lbs Adjustable Weighted Vest in Camouflage. This vest is comfortable to wear and comes with 10 ir0n ore weights of 4lbs each. 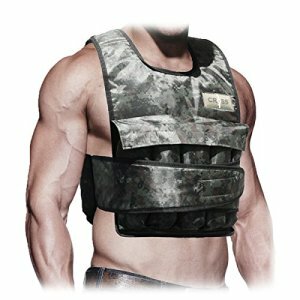 The total weight of this vest with all weights added is 40lbs. This will give you a lot of resistance to your training and enhance whatever workout you’re doing, whether it’s crossfit, sprinting, cross training or strength training. Even though it carries a lot of weight the vest itself is quite compact. In fact the vest will only come down from your collarbone 13 inches and has a width of 15 inches. It includes a one year warranty so if something does go wrong with the vest you’ll be able to return it for a new one. The Cross 101 Weighted Vest is comfortable to put on and comes with a belt that you can tighten to make sure all the weights are fitting snugly against your body. This should reduce the possibility of having the weights jiggling about while you’re doing your workout. This weighted vest is not hard to put on and take off. In fact the weights should slide easily into their positions and are easy to take out again as well. With 40lbs of weight in there it will be a little heavy to pick up and get your head through but this is to be expected when carrying so much weight. Are ordinary pushups getting a little too easy? Now you can add weight to your exercises and take your body to the next level. This Cross 101 weighted vest is good for all kinds of exercises and should enhance your power, agility and strength. This vest is half the price of other similar vests in this category and still does a great job. 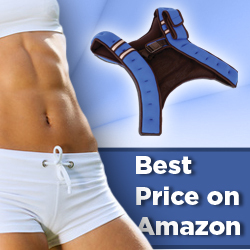 It’s comfortable, easy to wear and easy to add and remove weights. * Weights Included. 10 x 4lbs Iron Ore weights. * Weights are adjustable in 4lbs Increments. Max weight is 40lbs. * One size fits All. Manufacture warranty included. * One piece design with belt attached onto the vest for easy setup. * ONLY 13″ in width. Customers say that the Cross 101 40lb weighted vest is great value for money. They love how easy it is to slip the weights in and out and how snug it fits around your chest. The only complaint is that the material can rub on your neck a little. You made need to wear a t-shirt or add some soft material around the shoulder straps to remove any potential for soreness here. The Cross 101 40lb Weighted Vest is currently on sale for around 50% off the retail price. This is a fantastic deal and considering how sturdy and easy the vest is to wear it makes this one of the best offers on Amazon. It’s handy having so many adjustable weights and a max weight of 40lbs is pretty decent as well. The only concern is the potential for the shoulder strap to rub against your neck but this can be alleviated with a small piece of fabric. To find the best price for this weighted vest click here now.